Kneehigh’s latest is one of their best. It’s so good that I’m back to see it a second time less than a month after its visit to Birmingham’s REP theatre. A new version of The Beggar’s Opera this is not a good advertisement for humanity but an excellent advocate for live theatre. You just don’t get this kind of stuff on the telly or Netflix. Unbridled in its theatricality, this exuberant production pulls out all the stops to tell its tale of establishment corruption, mirroring the personal corruption of individuals. There is live music, newly composed by Charles Hazlewood, lively choreography by Etta Murfitt, and puppetry by Sarah Wright – the eponymous dog is the cutest you’ll see (before his demise, of course!). The ensemble cast is the heartbeat of the show, expending energy and displaying versatility to bring Carl Grose’s deliciously lurid script to irresistible life. Dominic Marsh is the amoral but amiable Macheath, our anti-hero, hired to assassinate the Mayor (Ian Ross) who knows too much. The town is really in the pocket of Les Peachum and his Mrs. Martin Ryder oozes sleaze as Les but it soon becomes apparent that it’s his wife (Rina Fatania) who wears the (leopard print) trousers. Fatania almost steals the show with her grotesquely hilarious performance. I would not like to meet her down a well-illuminated alley, let alone a dark one. Beverly Rudd is a bluff Lucy Lockit – her song about being a ninja butterfly is a definite highlight in a show that is nearly all highlights. Hazlewood uses strains of Greensleeves and Over The Hills and Far Away from John Gay’s original work to enhance his own vibrant score, which has elements of funk, jazz, punk and ska all working together. It’s infectious. Lucy Rivers has taken over from Patrycia Kujawska as the Mayor’s widow and perhaps the only ‘decent’ character in it – her stirring violin playing is an expression of her grief, complementing her emoting. Angela Hardie sings sweetly as the Peachums’ daughter Polly – until she turns to the bad, that is, while a bekilted Giles King is a lot of fun as corrupt copper Colin Lockit, squawking into his loudhailer. Best voice of the lot though must be Jack Shalloo’s as Filch. He also appears as other characters, each of them extremely funny. Sarah Wright’s puppets are both charming and horribly satirical. A Punch and Judy show mirrors the live action (just as the live action is a caricature of our world) but unlike Mr Punch, Macheath is ultimately unable to defeat everything life chucks at him. It’s a nasty, cesspit of a story. Director Mike Shepherd uses Brechtian ideas to entertain us. There is no revolution, the play says and I tend to agree. That should be its rousing call to action but it isn’t. It’s an entertaining wallow through the mire of our society – we enjoy these horrible people who have free rein to do what they like, and the sheer breath-taking impact of the performance exhilarates. I will never see those anti-social wheeled suitcases in the same light. Every time I am nearly tripped by one, I shall suspect there’s a dead dog in it. Emma Rice’s production of this new play by Tanika Gupta has Kneehigh running through it like Blackpool through a stick of rock. All the familiar elements are here: the singing, the puppet children, the music, film projections… giving the story of the experiences of a range of Indian characters in Victorian London both a mythic and a contemporary feel. This is the black-and-white days, in terms of the palette and also the politics. 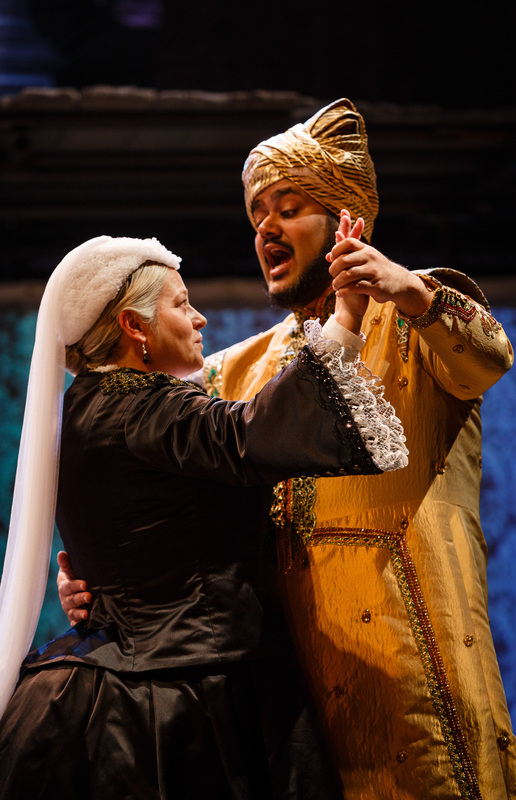 Abdul Karim (the charming Tony Jayawardena) arrives in England as a gift to Queen Victoria. Vicky takes to him right away, thanks to his promise to cook curries for her. He sets about to spice up her life and causes more and more of a stir in the royal household. This is similar to the film Mrs Brown, in which Vicky cosied up to her equerry, Billy Connolly. We visit their relationship at various points in the Queen’s final decades, and while Karim becomes more favoured and promoted, the scenes are all rather similar. Perhaps if Her Maj had been more diffident with him to begin with and he had had to thaw her reserve, the impact of her declaration, in Hindi, that she loves him, might be more striking. This is also the story of Rani (Anneika Rose) who travels to England as a nanny but is promptly dismissed by her employers as soon as they dock. Her fortunes rise and fall and rise again, Cinderella in the big city; a Victorian gentlemen takes advantage of her when she impresses him with her culinary skills and throws her out, pregnant and destitute. We see Rani change from the wide-eyed naive girl to an assured and educated and accomplished woman. You can almost hear Beyonce saying “You go, girlfriend.” Her boyfriend Hari (Ray Panthaki) leaves her behind, becoming increasingly politicised thanks to his harsh treatment, before returning for a storybook reunion at the end. Again, this is a moment that should be more touching. A madras moment rather than a korma. Rose carries most of the weight of the piece. It is through her that we visit the backstreets and underworld of Victorian London. As she learns about prejudice and the fate of ayahs, we do too. She gives a likeable performance of a fairytale heroine. As Queen Vic, Beatie Edney adopts a ‘royal’ intonation, ‘royal we’-ing all over the place and giving the notoriously not-amused monarch a surprisingly girly giggle. We get a sense of the authority of the woman and also the humanity – I just would have liked this aspect to be coaxed out of her with a little more resistance. Lez Brotherston’s set evokes a sailing ship and there are monochromatic miniatures of London landmarks. The floorboard stage is edged by a moat, reminding us of the sea, and the island nation. After Vicky pops her royal clogs, the cast set fire to little paper boats and float them in this water as tribute. But there is also a sense of burning boats – Rani, Hari and Karim are on their way back to India, never to return. This is the kind of moment of theatrical impact Emma Rice does so very well. Rina Fatania adds comedy as the worldly Firoza. In the second act when the piece begins to take on a slightly more documentary feel, she gives a speech about her life experiences. Vincent Ebrahim has dignity as the prospective MP who faces Tory opposition; he, when elected, makes a speech describing the true conditions faced by people ‘liberated’ by colonisation. It’s all well-presented and well-performed but it’s all a bit soft-edged. There are lessons to be learned from the past and parallels with the treatment of immigrant workers of today. Wrapped up in this, admittedly enjoyable, presentation, the story is warming but lacking in bite.